Today has been a very full day. I started with a cup of coffee, then a 9am grocery run, and since then I've baked two loaves of bread, between 3 and 4 dozen cookies, and the first of two dozen oatmeal muffins are in the oven as I'm typing. And I feel as though I've earned a breather. Looks beautiful, doesn't it? All settled in, with a cardigan that's not done enough for me to breathe easy and a well-earned cup of coffee. My version of a perfect afternoon. I planned to get that first sleeve done (only one inch left on it!) before play rehearsal, then work on the second during a long break I have during rehearsal today. But oh, how the universe laughs at plans. So now I guess I'll probably work on the baby blanket during play rehearsal. I'm so bummed right now that my perfectly planned plan is no longer in effect, I almost don't want to drink my treacherous coffee. I've driven for about 18 hours the past three days. I lost track of how much coffee I was drinking after cup 3 on day one. I know I drank coffee at 11:00PM both nights I was away, I know I fell asleep by midnight anyway. But it was a good trip. And now I'm back home, in my room, with my dog. I decided to bring Mottled Daydream with me, for those of you who were wondering, but it didn't get knit on at all. 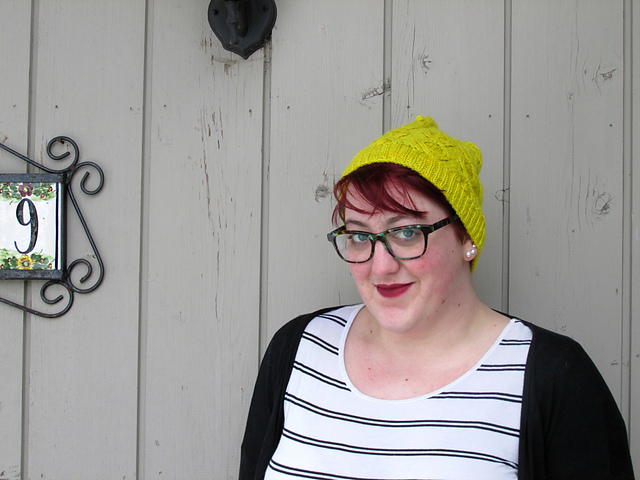 Instead I was tempted by the lovely Ella, just published a few days ago by Hannah Fettig, who's been one of my favorite designers since I started knitting. I'm knitting it in Red Heart cotton crochet thread (that for some reason I have 3000 yards of, what was I thinking?!) and I'm liking it so far. I've had bad luck, historically, with knitting cotton sweaters, and I really wonder if this will work in cotton, but I need something summery and easy. So far it's a really fun knit. I haven't had a whole lot of knitting time the past couple of days, but my knitting load has lightened up just a little right now, and this is a nice break. I want to try to be the kind of knitter that knits before bed every night, and I think this will be a good bedtime project. Also I am a terrible planner and it was 25 degrees cooler where I was going than I planned, so I had to get up crazy early on Saturday to try and find some kind of wrap before I had to be at work. (I am so disappointed in myself: I went back and forth for three days debating whether or not to bring a shawl, and I decided not to because, "there's no way I'll need one, it's summer!" Stupid Kat.) I found this at the third place I tried, and paid a ridiculous amount for it, but it kind of saved my sanity. And I'm a sucker for florals. Ta-da! I finished these with time to spare, which almost never happens! I kitchenered the second toe on Sunday evening and gifted them on Tuesday. The first time I saw this pattern, I knew that I had to knit them for my mum since she loves gardening so much. The yarn is Malabrigo Yarn Sock, colorway Lettuce. I bought three skeins of this stuff from my "local" yarn store (it's an hour away, but it was my LYS when I was a student, and I go back every time I'm in the city) last summer. I have big plans for the other two skeins, but I figured I could spare a pair of socks' worth for these. This isn't the fist time I've knit with this yarn, but it's the first time I've made socks with it, and the result is divine. These are so buttery and soft that I almost had to keep them for myself! My mum loves them, and she's actually looking forward to autumn so she can wear them. I reworked the chart to knit from the top-down, and I'm pretty pleased with how they came out. I love the leaf motif, and I think the pattern works really well with this yarn. They were a ton of fun to knit, and pretty easy, once I had the chart figured out.